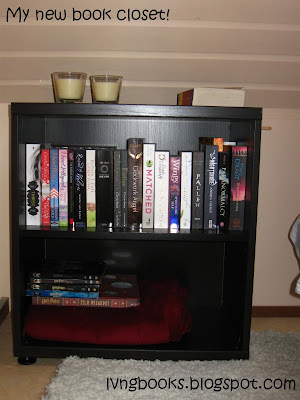 Loving books: Book closet - my new baby! If you are following me on twitter (you don't? What are you waiting for! @Lvngbooks) you may have seen me rambling about a new book closet because my big closet is getting too full. I had limited space, so I had to go for a small closet.. So I looked into IKEA's online catalog and went to the store. It took me some time to decide, but I finally decided to go for the small Besta cabinet with three shelves. The shelves were too close together, so I decided to only put one shelf in, so I have a total of two shelves. The assembling went pretty good, if I say so myself! It went quickly and I only broke two nails - which is a win, in my eyes. So of course, I wanted to put my new precious cabinet in its place. But er, it didn't really fit. Well, actually, it did fit, but I didn't have as much room as I anticipated and I ended up having only a couple of centimeters to get to the bottom shelf. So to make a long story short: I ended up reorganizing my entire room and I ended up with a little book closet that now also functions as my night cabinet. Win! Isn't it pretty? It's dark brown, almost black and it has two shelves with enough space to doublestack books. I'll use the bottom shelf too, but for now, my blanket has a new home. I really like how it turned out, even though I didn't plan it like this. I like it better than my initial idea, even! I'll try to film a book shelf tour in the weekend. I tried it last week as well, but people kept coming in and yelling so they screwed up my material. Boo! I'll split it in two clips - because my other book closet is pretty big. What do you think of my new little closet?